Ryan Poppitz, WHS player and former PWYBA player, has been selected to play in the Minnesota Lions All-Star Game. The PWYBA is very proud to sponsor Wayzata High School senior baseball player, Ryan Poppitz, at the upcoming 2012 Lion’s All-Star Baseball game(s), June 22 – 23, at the Chaska Athletic Park. Ryan won 10 games on the mound this spring for the Trojans helping them to a runner-up finish in Section 6 action. (The last Trojan to win more than 10 games in a high school campaign is our current 12 AAA PWYBA Travel Coach, Chip Engdahl, way back in 1989.) “Popps” is on the West Metro team for the Lion’s All-Star contest and they play Friday, June 22, at 7:00pm and Saturday, June 23, at 12:30pm and 6:00pm. All games are at the Chaska Athletic Park in Chaska, 6 blocks west of Highway 41 on 1st Street West. Many of you have seen Ryan during the winter volunteering his time and skills at the CMS Dome helping out the PWYBA at our various clinics. Please wear plenty of Wayzata Baseball apparel when you go to Chaska and support Ryan Poppitz on this great accomplishment. Good luck to Ryan at the Lion’s All-Star Tournament and next year at Concordia University in St. Paul (where he will be a two-sport student athlete). You can also watch Ryan on the diamond this summer playing for Wayzata Legion Post 118. Ryan has played in the PWYBA since 2002. He played on House and Tournament teams as a 10 and 11 year-old. He played on Travel AAA teams when he was 12-15 years old. As a 15 year-old, Ryan split his time between 15 AAA and the Legion Team. That year they made it to the state tournament with both teams. In 2011 Ryan was named Wayzata Legion team MVP, and also won the Al Pierson Award; as outstanding pitcher in the South Hennepin League. He was a 4 year letter winner at Wayzata High School in baseball. As a junior, Ryan was All-Conference Honorable Mention as a catcher. As a senior, he was All-Conference as a pitcher. He has played every position on the field during his high school and Legion careers. 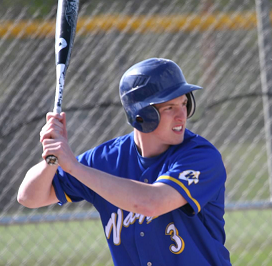 Ryan was a tri-captain for the Wayzata High School Baseball team in 2012. Ryan also is a 3 year letter winner in football at Wayzata. He was a 2 year starter as middle linebacker; a member of the 2010 class 5A State Championship team. His senior season was cut short with a knee injury. Despite only playing 9 games, he had 97 tackles, with 19 for loss. The team had a 20-0 record during the two years that he started. As a junior, Ryan was named All-Conference Honorable Mention and named First Team All-Area. As a senior, he was named All-Conference, All-Area, All-Metro, and All-State First Team as middle linebacker. Ryan will be attending Concordia University in Saint Paul in the fall of 2012 on scholarship, to play Baseball and Football.